But the Mantras to earn these Siddhis are extremely extremely rare and very difficult to find. I am giving here one such Mantra and the Sadhana of that Mantra to get these Siddhis. This Hanuman Mantra Sadhana is easy but lengthy. And this Sadhana needs to be kept on repeated depending on devotion to attain the Siddhis. I am sure that the people who are Hanuman devotees and those who want to attain Siddhis will love this Mantra Experiment. This is an unfailing Sadhana, which only works for devoted Hanuman Bhakts. 1] From the first Tuesday of a Shukla Paksha, at night, sit facing the north direction on a red velvet Aasan in your Puja room or in a place where no one will interfere while you are performing the Mantra Sadhana. Only wear red or Sindur colored clothes. 2] Keep a red colored Chowki in front of you. On it spread a red colored cloth and make a small mount of red rice and keep a Pran Prathisthit Shri Hanuman Bisa Yantra. This Yantra can be found in holy places like Ayodhya, Mehndipur, Rameshwaram, and Varanasi. This Yantra is very very rare to find. So I am adding a rough photo of the Yantra for reference. 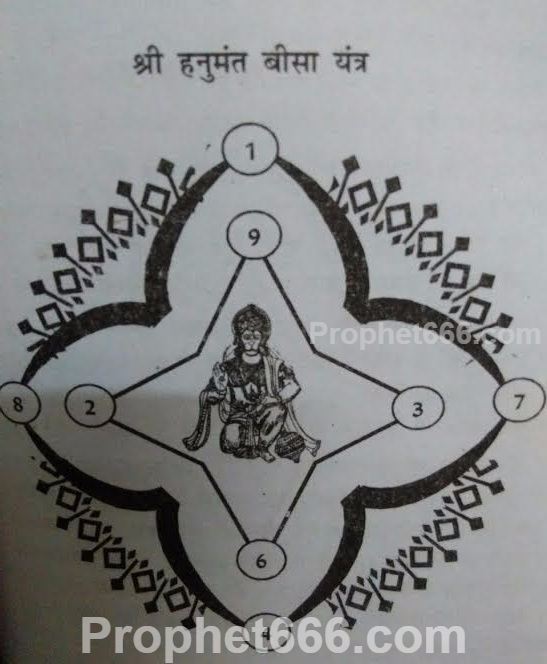 If you don't find the Copper Yantra then get this Yantra photo printed and do Pran Prathishtha of it and get it framed. 3] Keep Rama Darbar idol behind the yantra. and do Panchopchar Puja of the idol and the Yantra. While doing puja of Rama, keep chanting “Jay Shri Rama" and while doing puja of Yantra chant the siddhi granting Mantra continuously. Panchopchar puja involves Dhup, Deep, Gandh, Pushp, and Naivedya. For Gandh, offer Kewda to the Hanuman Yantra and Ashtgandh to Ram Darbar. For Dhup use Guggal only. For Naivedya offer Bananas only. Or else, take a Bhakri, keep Gud & Chana in the middle and pour 1-2 tablespoons of sesame oil in between and keep it in a vessel near the Chowki. Bhakri, 2 Til or Besan Laddoo, Pataakaa, Langot, Janeu, Khadau, one coconut, 50 to 100 gms Sindur, Chameli oil and 25 paisa coin. 5] Come home and do Panchopchar Puja again. While doing the puja, keep on chanting the Bisa Mantra I am giving, continuously. 4] After that, chant 21 rounds of this Mantra and sleep there itself. 5] Repeat all of the above steps for 20 days. 6] On 21st day, offer 21 Ahutis of the Mantra in a Havan. Feed 21 Bhramans. This is a tried and tested Sadhana and anyone who is a devoted Hanuman Bhakt can do this Sadhana. Observe fast while doing Sadhana and only and only eat fruits and drink raw milk all 21 days. Sir is photo ne prophett666 hai, please original without logo ki photo mil sakti hai kya? 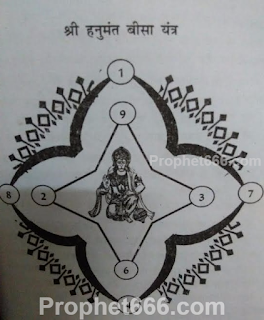 As Ashok Mehta has mentioned, this is only a rough photo for reference, if unable to find such a Yantra, you can get the likeliness of the reference sketch of the Yantra printed. @lashmiganth @ mallikha suresh ; I can not guaranty the correctness of my transliteration, but the mantra is like this:aumsometlike hrang hring hreng hronhhrong ham(ng)ah sri Hanumate namah(a) rng rām (bhakt ?dont know this one for sure) hng hanumantā sarva siddhi pradah sarva sankatādi nāsākah ang anjaniputri anjaneya mama sahāya kuru kuru svāhā. I have tried my best, it a bit aresearitnd you will find truth. I wish you goodluck with your sādhanā. I would also kindly advise you, if I may, to learn the basics of samskrt, and maybe some hindi. Hello sir. Sir I want to read hanuman chalisa 11 times everyday for 41 days . To overcome health problems and difficulties. Sir but my question is. Iam a married woman , maintaining celibacy till 41 days is necessary ? Or avoiding non veg food is enough ? Some of my friends doing this sadhana don't eat non veg but don't maintain bramha charya . As they are also married. Sir is it compulsory for married woman to maintain celibacy during course of sadhana.? I want to read hanuman chalisa. But Because of this dilemma Iam unable to do sadhana. Brahmacharya and avoiding non veg is compulsory. Can this sadhana be done alternatively @ Morning Time @ Brahm Muhurat(Between 4am-6am)? Guruji, i m a very very devoted devotee of Lord Hanuman....so i wanted to know that kya ASHTA SIDDHI AUR NAVA NIDHI prapt karne ka yehi ek mantra hota hai ya anya mantra bhi hain GURUDEV? Ashok Sir,can we make any alterations to this sadhana?Jaise ki instead of 21 days,can we do for 41 days?And instead of raw milk can we consume pure vegetarian food and instead of havan can we do something else? Will we experience siddhis soon after this or will it take time? That solely depends upon the dedication and sheer intensity of your Sadhana. शामिल हैं. माला रुद्राक्ष की हो सकती है,परंतु प्राण प्रतिष्ठित हो. do madhushrava gandharvini sadhana for help you can contact nageshshenai00@gmail.com. What is the procedure to chant Panchamukhi hanuman kavach and how many daya we should recite. Please let me these details please. Namaste Ashok sir. Can you please possibly put up the english version to this mantra? Or can you please give me any guidance to translating it? There is a post here in which someone translated it but its not clear.